Much of what we know of ancient Persia’s history has been informed by studies of the magnificent site of Persepolis, the capital of the Achaemenid Persian Empire from the 6th to the 4th centuries BC. UNESCO world cultural heritage sites since 1979, these well-preserved ruins in Southwestern Iran constitute the most important examples of Achaemenid dynastic architecture in Iran. Although it has long been known that these monuments and reliefs were painted, new research in the fascinating field of polychromy, or color, will be presented at this Saturday’s Scherman lecture at the Legion of Honor by Dr. Alexander Nagel Assistant Curator, Ancient Near Eastern Art, Freer│Sackler Galleries. Nagel will deliver “An Empire in Blue—Color in Persepolis: New Research on the Polychromy of Achaemenid Persian Palace Sculpture, ca. 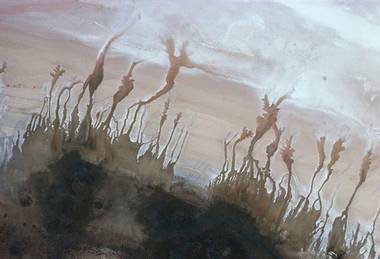 520 to 330 BCE,” at 2 p.m. The event, organized by FAMSF’s Ancient Art Council, is open to the public. Following the lecture, David Stronach, Professor Emeritus, Near Eastern Studies, University of California at Berkeley and one of the world’s leading scholars on ancient Iran, will be on hand to sign hot-off-the press copies of his Ancient Iran from the Air, published by Philipp von Zabern, which just arrived from Germany. The book, co-edited by Stronach, is a remarkable collection of aerial photographs taken by Swiss photographer Georg Gerster between 1976 and 1978 of Iran’s arresting landscapes, archaeological sites, and historical monuments. The book will not be available in bookstores until the fall but it will be sold at the Legion’s bookstore on Saturday. Dr. Alexander Nagel collecting data for his research on polychromy at the Throne Hall built by Xerxes and completed by his son Artaxerxes I at the ancient site of Persepolis. Photo: courtesy Alexander Nagel. New Insight on old Color: Dr. Nagel is what we might call a chromovore. Fascinated with all aspects of color, he is at the forefront of contemporary research in polychromy, which is an exciting intersection of archaeology, anthropology, science, and conservation studies. The emphasis is on using new technology to analyze old color and refining the actual meaning of color in the ancient world. Nagel is part of a team that, in 2006, began a systematic building-by-building investigation into the role of colors, pigments and other materials on the surface of the monuments and buildings excavated between 1931 and 1939 on the terrace platform of Persepolis. During his great march across Asia, Alexander the Great was determined to see the end of the Persian Empire, the splendid Persepolis in particular, and he wreaked extensive destruction on its palaces, even setting the city on fire, but did not succeed in obliterating it. Early travelers noted traces of paint on its stone sculptures and monuments, which has long fascinated researchers, but, prior to Nagel, no one has so systematically examined color and pigment. 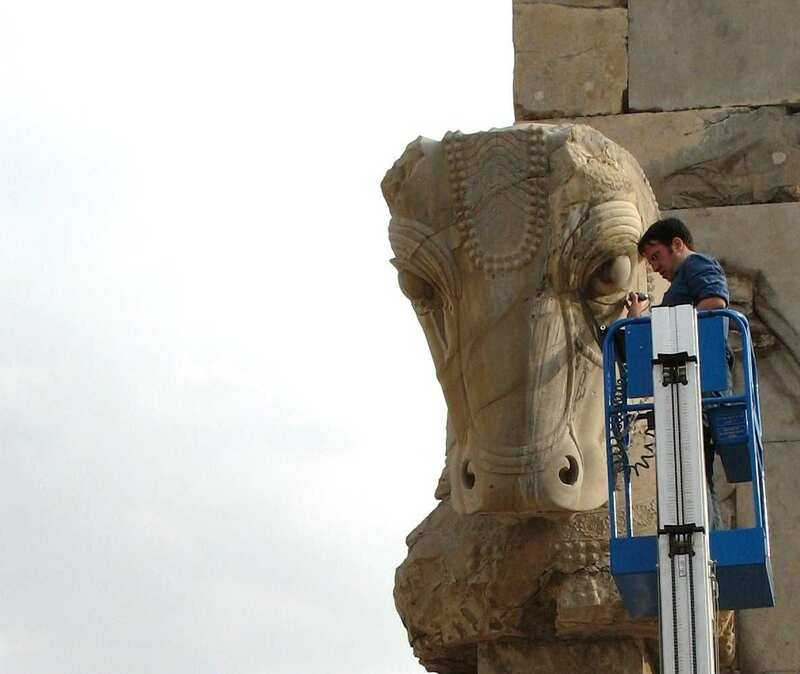 Nagel will describe his research and will reveal how his results can change our perception of the ancient Near East, as well as discuss a range of issues relating to restoring the polychromy of ancient structures. 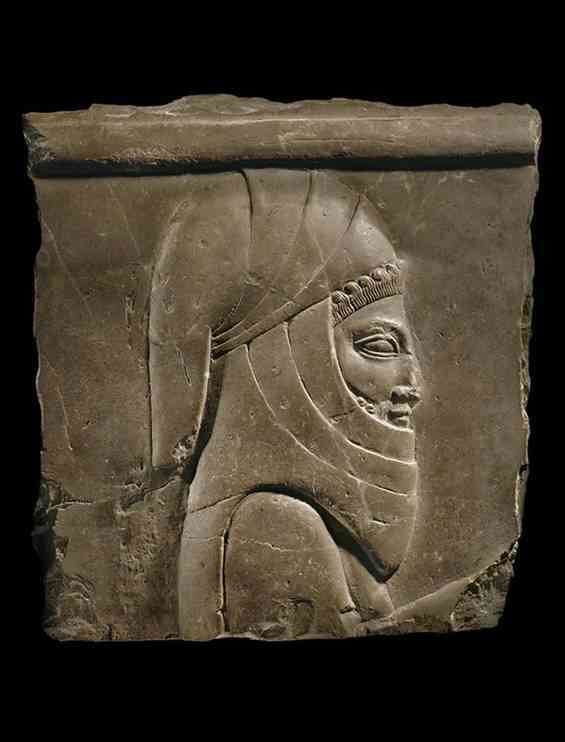 Relief of a Gift Bearer, Persian, Achaemenid Empire, Persepolis, Palace of Darius or Xerxes, ca. 490–-470 B.C., Bituminous limestone, 2008 Fine Arts Museums of San Francisco, purchase from various gifts and funds. Photo: courtesy FAMSF. The relief’s journey out of Iran most likely occurred in the 19th century when a number of small-scale reliefs (often showing servants or guardsmen) were removed from the ruins at Persepolis. When these reliefs reached Europe, they were frequently trimmed to leave a neat, square shape suitable for framing. As a rule, little more than the face and headgear were left in view. 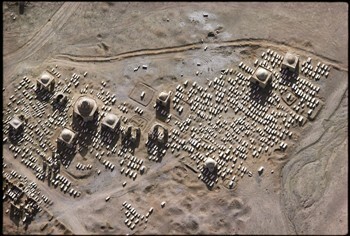 Georg Gerster’s aerial photograph of the Sassanian City of Gu/Firuzabad, Iran. The city is divided into 20 parts, radially structured and extends over a plain crossed by pathways, drainage ditches, and irrigation channels. The tower at the heart of the city was essential for measuring the radial lines and also had a symbolic significance, as did the city’s circular shape. Photo: Georg Gerster. Dr. Alexander Nagel, F|S assistant curator of ancient Near Eastern art, examining pigments left on a squeeze (a multidimensional mold) from the inscriptions of the façade of Darius I (d. 486 BCE). By analyzing the raw incidental artifacts that were picked up as molds were being made, Nagel, was able to identify the paint pigments left in the squeezes. Photo: courtesy Smithsonian Institution. 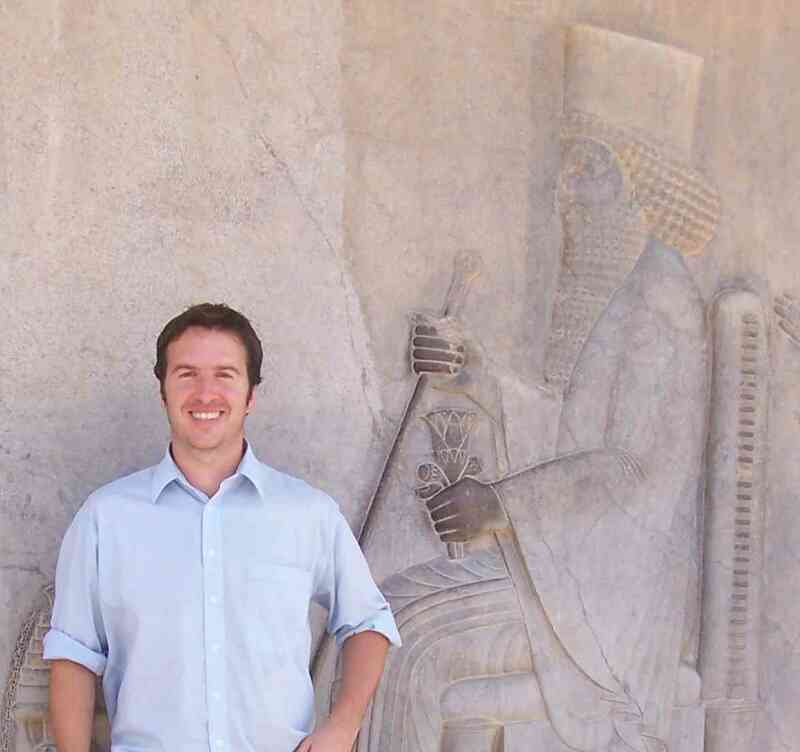 More about Alexander Nagel: Originally from Germany, Alexander Nagel earned his PhD from the University of Michigan, Ann Arbor, with a focus on the art and archaeology of ancient Iran. His dissertation, completed in 2010, is titled Colors, Gilding and Painted Motifs in Persepolis: The Polychromy of Achaemenid Persian Architectural Sculpture, c. 520–330 BCE. 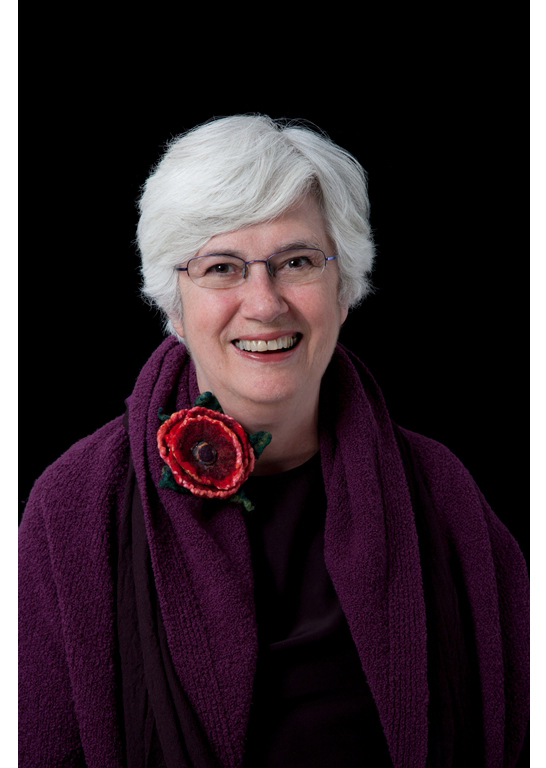 Nagel has helped organize numerous international conferences, including the landmark 2009 workshop The Color of Things: Debating the Current State and Future of Color in Archaeology at Stanford University. He has authored several articles on his research, and has lectured in Europe and the United States on polychromy and the archaeology of the ancient Near East. 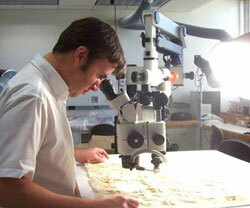 In 2009, he was the University of Michigan Freer Fellow in residence at the Freer and Sackler. I n fall 2010, he joined the Freer|Sackler staff as assistant curator of ancient Near Eastern art. Nagel’s’s first F|S exhibition, Ancient Iranian Ceramics, opened in July 2011. The Scherman Lecture Series is sponsored by the Scherman Family Foundation. This lecture is held annually and followed by a reception for all attendees. The Ancient Art Council is one FAMSF’s many specialized groups and offers regular programming, including lectures and tours, for those who share an interest in ancient art and the preservation and promotion of antiquities and culture of the ancient Mediterranean and Near East. Details: “An Empire in Blue—Color in Persepolis…” by Dr. Alexander Nagel is at 2:00 p.m, Florence Gould Theater, Legion of Honor, San Francisco. The lecture is free to the public. Georg Gerster's aerial photograph of the Sassanian City of Gu/Firuzabad, Iran. The city is divided into 20 parts, radially structured and extends over a plain crossed by pathways, drainage ditches, and irrigation channels. The tower at the heart of the city was essential for measuring the radial lines and also had a symbolic significance, as did the city’s circular shape. 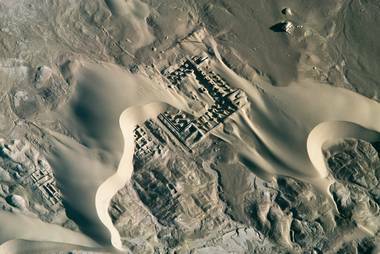 Gerster is about to publish a new book of aerial photographs of ancient Iran. Photo: Georg Gerster. My first encounter with Swiss photographer Georg Gerster’s magnificent aerial photographs of the monuments of the ancient Near East opened up a fascinating new world—one of tantalizing beauty, riveting abstraction and amazing compositions. For over 50 years, Gerster has been delighting audiences the world over with his breathtaking aerial shots, ranging from mountains and deserts to agrarian and industrial landscapes as well as world’s most spectacular archaeological sites and ancient monuments─from the temple at Karnak, Egypt, to the Acropolis in Athens, Greece, to the Great Wall of China, to the “big houses” of Caserones above the Tarapacá Gorge in remote Chile. Not familiar with his work? Google his name and the images are immediately familiar—they’ve appeared frequently in National Geographic and, in the 1970’s, Gerster did a series of now highly-collectible aerial images for Swiss Air, images which they developed into posters that represent a fabulous fusion of land art, minimalism and Gerster’s brilliant artist’s eye. He started in the Sudan in 1963, on board a Cessna 72 with a Swedish pilot and has since taken photographs in 111 countries on all six continents. Desertification: Sistan, Iran. Barchan dunes in the process of reburying the remains of Dahan-e Ghulaman, an Achaemenid site first excavated in 1962. Georg Gerster, 1977. Photo: Georg Gerster copyright. Gerster is about to make big news again with the publication of Ancient Iran from the Air, a new book of aerial photos of ancient Iran. 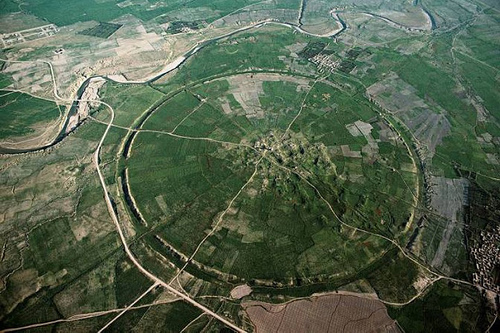 Between April 1976 and May 1978, Gerster flew across the length and breadth of Iran to photograph the memorable landscapes, archaeological sites, and historical monuments that characterize this storied land—the Sassanian city of Bishapur, the Sassanian imperial sanctuary at Tak-kt-I in Suleiman, Luristan, and Cheqa Nargesm in Mahidsasht, Iran—to name a few. Most of the photographs were safely stashed away in his archives in Switzerland. Quite recently, David Stronach, Professor Emeritus, Near Eastern Studies, University of California at Berkeley and Co-Director, UC Berkeley-Yerevan State University Excavations at Erebuni, working with Gerster and a number of reputed specialists in the art and archaeology of Iran, arranged to have these images published. Ancient Iran from the Air provides—from a distinctly novel angle—a fresh appraisal of the greater part of the long history of the built environment in this crucial part of the ancient Near East. Isfahan, the Pre-e Bakran cemetery, near Isfahan. Photo: Georg Gerster copyright. On Saturday, December 3, 2011, at 2 p.m., Stronach will give a presentation at San Francisco’s Legion of Honor featuring a selection of Gerster’s most arresting aerial views—and include the latest background information about those prehistoric, Achaemenid Persian, Parthian, Sasanian, and early Islamic sites “visited” through the medium of aerial photography. Stronach is one of the world’s leading experts on ancient Iran, particularly the ancient city Pasargadae, the capital of Cyrus the Great (559-530 BC). In 2004, he was honored as the recipient of the Archaeological Institute of America’s Gold Medal for Distinguished Archaeological Achievement, the highest honor bestowed by the AIA. In the 1960s and 70s, Stronach was the Director of the British Institute of Persian Studies in Tehran. In addition to a long and distinguished teaching career at UC Berkeley, he has delivered lectures on ancient Persia all over the world. This program, sponsored by the Ancient Arts Council, continues the celebration of Professor David Stronach’s 80th birthday. The Ancient Arts Council is one FAMSF’s many specialized groups. It offers regular programming, including lecture and tours, for those who share an interest in ancient art and the preservation and promotion of antiquities and culture of the ancient Mediterranean and Near East. Lake Maharlu, Iran. The level of Lake Maharlu, a salt lake, fluctuates over the year. When it is low, mature reddish brine collects at deep points of the drainage channels near the shore, and salt crystallizes on the lake. 1976. Photo: Georg Gerster, copyright. In his best-selling catalog The Past from Above (2003)(p. 10) Gerster is quoted as saying ”distance creates an overview, and an overview creates insight,” a truism which is integral to archaeological research. Aside from their aesthetic impact, Gerster’s photos show the landscape, the geographical context and the area covered by a settlement, together with surrounding natural resources. An aerial view also occasionally allows for the discovery of some previously unknown monuments that have been invisible from the ground. Details: “Ancient Iran from the Air,” Saturday, December 3, 2011 – 2:00 pm, Florence Gould Theater, Legion of Honor, San Francisco. Cost: Free with Museum admission to Ancient Arts Council members; $5 suggested donation/non-members.